One of the amusements of the nation's capital area, where TMQ lives, is Chainsaw Dan Snyder's 12-year effort to demolish the Washington Redskins. Every year you think it's finally happened -- Snyder has made every possible boneheaded blunder, and the Redskins at last can recover from his misrule. Every year you're wrong -- Snyder thinks up another entirely new way to sabotage the team. This has amusement value. No matter how many obvious blunders Chainsaw Dan makes, he's still able to dream up new ones. The man has a gift. At 5 p.m. ET yesterday, hours before the start of a "Monday Night Football" home game that was crucial to the Skins' season, Snyder granted a five-year contract extension worth $70 million plus incentives (although the actual length and earning potential is tied to a bonus this offseason, according to ESPN's Adam Schefter) to struggling quarterback Donovan McNabb. Pro sports players love to hear of their teammates getting big paydays. But even Redskins players reacted with: Huh? What? McNabb had been benched two weeks before for awful play. At 33 years of age, he is extremely unlikely to be with Washington another five years. Snyder did nothing to extend McNabb's contract last spring, after trading for him -- extending the deal then would have made sense. The Redskins had just finished their bye week, with many days of downtime in which to handle financial matters. Instead, this happened hours before kickoff of a nationally televised game. McNabb plays poorly, gets benched -- then is handed a lucrative extension. Huh? What? Washington promptly trotted out and played one of the worst games in NFL history, losing 59-28 to Philadelphia -- the margin could have been worse, but the Eagles stopped trying to score in the middle of the third quarter, when they already had 501 yards of offense. That equates to 800 yards of offense for a full game. McNabb celebrated his deal by throwing three interceptions, one a pick-six, and posting a wretched 69.4 passer rating. With his now-larger checking account, McNabb now has thrown more interceptions than touchdown passes in Washington, and is 29th in passer rating, trailing Jon Kitna and (you knew this was coming) Jason Campbell. The Redskins trailed 35-0 after the first snap of the second quarter. Under high school mercy rules, a game switches to "running clock" once a team leads by 35. If mercy rules applied to the NFL, this game would have gone running clock at the start of the second quarter. The situation was so messed up that even though the Redskins' cheerleaders danced throughout the first half in two-piece summer outfits -- despite a cool night and light rain -- 36 gorgeous scantily attired women dancing in the rain could not improve the home team's fortunes. 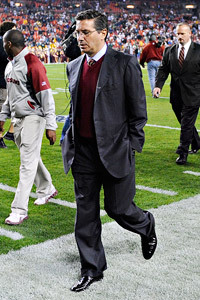 AP Photo/Nick Wass Chainsaw Dan Snyder -- a man with a gift. When well-run pro sports franchises trade a bundle for an aging star, a new contract is agreed to before the trade is announced. That's how well-run pro sports franchises handle this sort of thing. Instead, the Skins traded for McNabb and did nothing about his expiring contract. Besides Snyder, the Washington masthead lists -- to cite only the football side, not marketing -- an executive vice president/general manager, a chief operating officer, a director of player personnel, a director of pro personnel and a vice president of football administration. What were all these people doing in the seven months between when the Skins acquired McNabb and when they finally dealt with his contract in the hours before "Monday Night Football"? How could all these senior-titled football types have botched something so basic so badly? Chainsaw Dan projects a negative energy field, and maybe it impedes their judgment. Snyder has employed seven head coaches in his 12 years of owning the Redskins. In the previous 12 years of the franchise, the team had two head coaches, and a lot more success on the field. Snyder has a gift, all right -- a gift for making everyone around him perform poorly. Mike Shanahan seemed to know what he was doing as the head coach of the Denver Broncos. Since arriving in Washington and entering Chainsaw Dan's negative energy field, Shanahan's performance has plummeted. Not only has the new head coach mishandled McNabb; Shanahan arrived to find a very solid 4-3, conservative-scheme Washington defense that finished 10th in 2009 and fourth the year before that. Shanahan promptly threw out everything that was working and installed a blitz-wacky 3-4. The Redskins are now last in the NFL in defense. The defense looked like water last night, allowing Philadelphia 45 points in the first half. And Shanahan's game management! Trailing 42-14 in the second quarter, he had Washington punt on fourth-and-1. Punting on fourth-and-1 when down by four touchdowns! Scoring to pull within 45-21, he had Washington kick away, rather than onside. By the early third quarter, the overpaid and lethargic Albert Haynesworth, another Snyder blunder, was simply lying on the field watching Michael Vick run, making no attempt to pursue him. Haynesworth had quit on the game, which is the only thing he's really good at. But why not? Shanahan quit on the game in the second quarter. Chainsaw Dan gave Haynesworth $42 million guaranteed and almost immediately began trying to get rid of him, then gave the struggling McNabb a new deal. How long till the Redskins are trying to get rid of McNabb? Probably not long. Nobody cares about Snyder throwing his money out the window. But having to watch him destroy a storied NFL franchise -- that's another matter. As for Vick, obviously he played flashy last night. More importantly, he played like a quarterback! The Eagles' victory was not just because of his Warp Three runs. Vick had thrown for 333 yards and four touchdowns by the middle of the third quarter, when Philadelphia stopped trying to score. Vick was scanning the field and doing progression reads -- like a quarterback! Even in his best days at Atlanta, Vick either looked right or looked left but never both; his reads were "Check the primary receiver and if the primary is covered, take off running." Last night he played in a sophisticated manner, viewing the whole field and finding the best man to throw to. On the early third-quarter touchdown pass that made the score a laugher at 52-21, Vick looked left, then looked right, then found the open man in the center of the field. With his speed recovered, if Michael Vick consistently performs as a sophisticated passer too, watch out. In other football news, Free the Inactive Eight! In the Flaming Thumbtacks at South Florida Dolphins contest, Dolphins starting quarterback Chad Pennington left injured, then, in the third quarter, backup Chad Henne left injured. Miami went to the Wildcat until the fourth quarter began -- because if third quarterback Tyler Thigpen had entered the game in the third quarter, Henne, whose injury at that point hadn't been assessed, could not have returned. The Pennington and Henne injuries both are now known to be serious. The rest of what happened exposed the absurdity of the Inactive Eight. An NFL roster has 53 players. Before each game, eight must be declared inactive. If one of the eight is a quarterback, he can dress -- but if that player enters the game before the fourth quarter, any other quarterbacks who dressed are disqualified. Once the fourth quarter begins, the third quarterback can enter the game without restrictions on other players. The Inactive Eight is a vestige of the 1950s, when NFL rosters had 35 players, many of whom went both ways, and NFL owners fought like mad to keep rosters small to hold down costs. Roster limits kept rising, hitting 53 a generation ago. When rosters reached 45, several old-school owners complained that this was giving too many plums to players, that there should be fewer players. For a while there was a "moves" system that allowed each team a fixed number of back-and-forth switches each season between the regular roster and injured reserve. Then the roster was put at 53 and the Inactive Eight and the third-quarterback rule were created. This mollified the old-school owners, since the game roster did not expand. Sometimes players in the Inactive Eight list have injuries and wouldn't suit up anyway. In the main, the inactive list functions to prevent players from being on the field. Inactive Eight players get full game checks, benefits and vesting. They cost owners the same that active players cost. They just can't play. Which serves -- what purpose, exactly? With health always an issue in the NFL, it's ridiculous that eight players stand around doing nothing while the other 45 are pounded to exhaustion. It's ridiculous that the third quarterback can't play until the fourth quarter -- he can't even hold for placement kicks. There is no rhyme or reason to the Inactive Eight rule, which is purely a remnant of past owners' grumbling about money to players. With a new collective bargaining agreement in the works: Free the Inactive Eight! Stats of the Week No. 1: Indianapolis has scored on 31 of its 32 red zone possessions. Stats of the Week No. 2: In the Tennessee at Miami contest, six different players attempted forward passes. Stats of the Week No. 3: The two most-seen NFL teams this season, in share of the nation their games were broadcast to, are the Vikings and Cowboys: combined record 5-13. Noted by David Biderman of The Wall Street Journal. Stats of the Week No. 4: Matt Ryan is 18-1 as a starter at home. Stats of the Week No. 5: The 0-8 Bills, the NFL's sole winless team going into the weekend, were favorites -- because they were hosting Detroit, which lost an NFL all-time-worst 25th straight on the road. Stats of the Week No. 6: The Broncos lost a division game by 45 points, then won their next division game by 20 points. Stats of the Week No. 7: Cincinnati, Dallas and Minnesota, which made the playoffs last season, are on a combined 7-24 streak. Stats of the Week No. 8: Under Brett Favre, the Vikings are 12-1 at home and 4-10 on the road. Stats of the Week No. 9: The most recent three teams for which Terrell Owens has played -- Dallas, Buffalo and Cincinnati -- are a combined 5-22. Noted by reader Brian Buntman of Green Bay, Wis.
Stats of the Week No. 10: In the games in which Randy Moss started for them, the Patriots, Vikings and Titans are a combined 4-5. Washington Redskins You'd obey this first lieutenant's instructions. Chase the shouting winds along! Sweet Play of the Week The Cleveland Browns, suddenly everyone's trendy pick, led visiting Jersey/B 13-10 with 23 seconds remaining before intermission, Jets facing third-and-goal on the Browns' 1. Jersey/B lined up five-wide, the Browns lined up in a nickel. Five-wide with 1 yard to go -- maybe it's just as well Vince Lombardi did not live to see this. Mark Sanchez surveyed the defense and realized the Browns were so spread that between the tackles, the Jets had five offensive linemen versus four defensive linemen. So Sanchez simply ran up the middle, touchdown. Sweet, and the Jets went on to victory in overtime. Sour Play of the Week Dallas leading Jersey/A 9-3 in the second quarter, the Giants had third-and-goal on the Boys' 2. The Giants came out in a shotgun. Hakeem Nicks started to run a slant, then inexplicably stopped in his tracks; Eli Manning threw the slant, Dallas corner Bryan McCann cut in front and returned the pick 101 yards for a touchdown, turning a close contest into what would become a Boys rout. The botched play was sour. So was the call -- can't anybody just run at the goal line in the NFL anymore? Andy Lyons/Getty Images Indianapolis cheerleaders donned "hello, sailor" outfits for Veterans Day. Sweet 'N' Sour Play Indianapolis leading 20-10 late in the third, Cincinnati faced third-and-2 on the Colts' 41. This season the Trick-or-Treats have shown a tendency to play-fake on third-and-short. It's no secret. Play-fake, Carson Palmer bootlegs right and Indianapolis defensive tackle Eric Foster -- yet another undrafted player performing well for Indianapolis -- is not fooled and drops Palmer for a 7-yard loss, forcing a punt. For the Colts, that was sweet. For Cincinnati coaches, the call was sour. Third-and-2 on the opposition 41, the Colts having a suspect rush defense -- just run, a first down is likely. Instead a third-and-2 in opposition territory resulted in a punt. On the previous possession, Cincinnati had a third-and-4 in Indianapolis territory and ended up punting after a short pass. Ay caramba. Scoring to pull within 23-17 with 2:10, Cincinnati onside kicked. Last month yours truly decried "an officiating problem that has been driving TMQ crazy for years. In a scramble for a loose ball, if any player takes possession for even an instant, with a knee down and in contact with an opponent, the play should end. But zebras don't officiate mad scrambles this way. They let the players fight for the ball, then award possession to whoever wins the Darwinian struggle. Often the fighting continues although all players involved have their knees down." That's exactly what happened on the Cincinnati onside kick. Pierre Garçon of Indianapolis fielded the kick, had control and went to both knees. The whistle should have sounded -- down over. Instead, the zebras allowed players to fight and pull for the ball for a solid 15 seconds. Someone ripped the ball away from Garçon -- remember, he was down! -- and possession was awarded to Cincinnati. This botched call did not impact the outcome of the game. But had Cincinnati won, this botched call would be a leading item in sports talk right now. Wasteful Spending on Bodyguards Watch: J.T. of Phoenix writes, "Recently I was at a Phoenix Coyotes game and sat three rows behind Sen. John McCain. Not only did he not have a bodyguard, people were taking pictures with him and shaking his hand. If a sitting senator who ran for president just two years ago doesn't need a security detail, why do city council members, midlevel state officials and other minor political hacks receive taxpayer-funded bodyguards?" The Middle-School Trick Play: Many readers including Suzanne Harper of Providence, R.I., asked whether the middle-school trick play that got some attention during TMQ bye week is legal. Evidently the quarterback was shouting something about how 5 yards should be marked off, then the center handed him the ball while no one else on the offense moved; he marched forward 5 yards while the defense watched, then sprinted to the end zone. Matt Cardy/Getty Images The Auburn offensive line during a walkthrough. The ball does not have to be snapped between the center's legs -- this is a common misconception. As long as the offense is set following the ready-to-play signal, the snapper can simply hand the ball to the quarterback. And while the offense can't move before the snap, there is no rule saying the offense must move afterward. 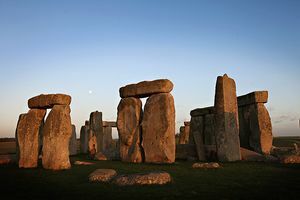 Having the offensive line not move, in order to mesmerize the defense for an instant, is a tactic TMQ calls the Stonehenge. Tulsa began using the Stonehenge line about five years ago, though for all I know, the idea may date to the 1940s. On the Browns' trick play touchdown against the Patriots, the Cleveland offensive line went Stonehenge in order to confuse New England about whether the play had started; Auburn used a Stonehenge play against Georgia on Saturday. Having the quarterback march around holding the ball, defense not realizing the ball has been snapped, is a longstanding youth league trick. In another variation of this action, the quarterback says loudly, "There's something wrong with the ball." The center hands the quarterback the ball, thus snapping; the offensive line goes Stonehenge; the quarterback walks toward the sideline as if to show the ball to an official, then sprints up the field for a touchdown. Though the snap and the Stonehenge line were kosher, TMQ thinks the middle-school play could be flagged. "No player shall act in an unsportsmanlike manner," says the National Federation of High Schools football rulebook which governs most high school and middle-school play. The NCAA and NFL have similar rules. Trying to trick the defense into allowing an uncontested touchdown doesn't sound particularly sporting, especially if it involves pretending to speak to the officials, since players are supposed to become passive when the officials are involved. The defense, at all levels of football, is forbidden from using "disconcerting acts or words" prior to the snap. Wasn't the offense using disconcerting words in this case? That seems unsportsmanlike -- and officials have broad discretion about applying that term. 'Tis Better to Have Rushed and Lost Than Never to Have Rushed At All: The highs-are-high-and-lows-are-low Broncos jumped to a 28-0 second-quarter lead on Kansas City. Now the Chiefs have first-and-goal on the Denver 8 with seven minutes remaining in the second quarter. Kansas City came into the game with the league's No. 1 rushing offense, Denver with the 31st-ranked rushing defense. So pound the ball four times for a touchdown. When you're down by a big margin in the first half, it's not an emergency -- run your regular offense, get a touchdown and then see what the world looks like in the second half. Instead Chiefs coaches called a pass; Matt Cassel ran backward all the way to the 19, where he was hit and fumbled; Denver's Jason Hunter took the fumble the length of the field for a touchdown and a 35-0 Denver lead that effectively ended the contest. Never panic in the first half; there will be plenty of time for that later! Kansas City panicked and abandoned the running game when there was still ample time. Afterward, Todd Haley accused Josh "When Does the Frat Party Start?" McDaniels of running up the score. Though TMQ doesn't like running up the score, I don't think that happened at Backgammon Field. Denver reached an insurmountable 49-17 lead at the beginning of the fourth quarter and then stopped trying to score, later punting from the Kansas City 36. True, many Denver starters were on the field too long in the fourth quarter. But the final victory margin -- 20 points -- was hardly unsportsmanlike. Kansas City sure didn't stop trying to score. UN The new United Nations Human Development Report -- just slightly more important than sports stats. TMQ in the News: Wednesday, I will be moderator for the Washington launch of the United Nations Human Development Report, one of the world's key documents. 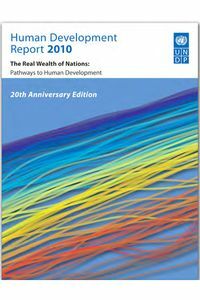 This year's report has a hopeful tone -- it shows that in most cases, poor nations are making decent progress. The report summary is here and the event announcement is here. I became interested in developing world advancement rates when researching my 2003 book, "The Progress Paradox," and have since done what I can to draw attention to the subject, including, in most recent years, helping the report launch. Long after the sports stats and Wall Street data we obsess about have been forgotten, the material in the new report will remain crucial to human history. Have a look. Steelers, Patriots Meet in Arena League Action: New England got steamrolled in Cleveland, then went to Pittsburgh and steamrolled the Steelers. This must prove that on any given Sunday -- no, I can't complete that sentence. Can it really be that a Steelers-Patriots game featured (adjusting for sacks and scrambles) 97 called passes and 39 called rushes? In recent years Bill Belichick has gone pass wacky when facing the Steelers, whose run defense is always stout. Pittsburgh went pass wacky against New England, knowing that its pass defense was 30th-ranked entering the game. But a Steelers-Patriots contest in which both teams opened in the shotgun spread, and stayed shotgun spread for most of the game, was a little too postmodern for my taste. The Steelers rushed only 16 times in a home game. Ye gods. Belichick as usual had the best game plan, throwing lots of short out patterns in the first half and then, when the Steelers adjusted at halftime, going down the middle in the second half. Undrafted free agents BenJarvus Green-Ellis, Wes Welker and Danny Woodhead gained 209 of the Flying Elvii's offensive yards. Undrafted free agents at New England and Indianapolis perform better than first-round draft choices at many teams. Trailing 10-0, the Steelers reached third-and-goal at the New England 4, threw an incompletion and kicked a field goal. Wouldn't a couple rushes have yield six points? Trailing 17-3, the Steelers reached second-and-goal at New England 8 and went incompletion, incompletion, missed field goal. Scoring in the fourth quarter to pull within 23-10, Steelers players celebrated wildly on the field, which showed lack of focus -- celebrate if you win, not when down by two touchdowns! Then, New England leading 29-18 with four minutes remaining and facing third-and-5, Pittsburgh blitzed seven men, and I don't even need to tell you who won the game. Kurt Snibbe/ESPN.com "Watson, I have discovered the Eagles are coached by Dr. Moriarty." 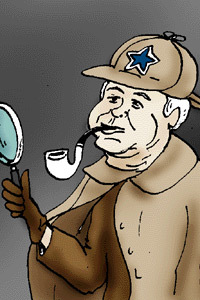 "When You Have Eliminated All Which Is Impossible, Then Whatever Remains, However Improbable, Must Be the Truth," Wade Phillips Said: The week before Wade Phillips was fired, Calvin Watkins of ESPN Dallas reported, "Phillips revealed he watched nearly two years' worth of games on tape and discovered fundamentals were lacking." Discovered? "Dr. Watson, come see what I have discovered!" Phillips must have been the sole person in the state of Texas unaware of this information. Phillips has a low-key coaching style -- he draws up game plans but relies on players to be professionals and prepare themselves physically and psychologically. This approach worked when he was head coach of the Broncos and Bills, teams that in his tenure had numerous mature veteran leaders -- John Elway, Karl Mecklenberg, Steve Atwater and Shannon Sharpe in Denver; Thurman Thomas, Ruben Brown, Bruce Smith and Henry Jones in Buffalo. Name the "mature veteran leader" on the current Boys roster. The Cowboys of late are a collection of overpaid, spoiled pretty boys more interested in their own publicity and party invitations than in leaving everything on the field, as NFL leaders do. Dallas had one head coach in the 29 years before Jerry Jones purchased the team, and has had seven in the 22 years since, counting Acting Temporary Interim Provisional Semi-Coach Jason Garrett. Is Garrett the answer? He had the Cowboys ready for the Giants. But with Jones down on the sidelines chatting up players during games, and seeming to make personnel decisions based on marketing rather than performance, it may be that no one could coach the current Dallas Cowboys -- even Tom Landry might not have been able to coach them. The Boys threw for 324 yards and three touchdowns against a Jersey/A defense that came into the game ranked first in the NFL versus passing. Were the Giants that bad or did we see what the Dallas offense might have been all along if Cowboys players were paying attention? Dallas looked well-coached, Jersey/A looked confused, with Coughlin and defensive coordinator Perry Fewell yelling at each other on the sideline -- a total role reversal from the Giants-at-Cowboys game of October. As for the Giants, sportsyak has been touting them as a top club -- yet they've been blown off the field by Dallas and Indianapolis and are just 1-2 against teams that made the playoffs last season. Trailing 33-20 at the end of the third quarter, Tom Coughlin ordered a punt on fourth-and-1 in Dallas territory. On the next possession, Jersey/A went for it on fourth-and-1 in Dallas territory and the play was stuffed. Consecutive possessions on which a power-rushing team couldn't or wouldn't gain a single yard at home! Still in the game at 33-20 with seven minutes remaining, the play clock was about to expire and Eli Manning signaled for a quick snap that sailed over his head, Cowboys recovery. Just use a timeout! AP Photo/Morry Gash He's just getting his second wind at pushup No. 496. Bucky Badger Workout Video Coming Soon: "Bucky the Badger had to do 83 pushups" -- sportscasters of several networks said words to that effect after Wisconsin scored 83 points against Indiana. Bucky did 573 pushups! 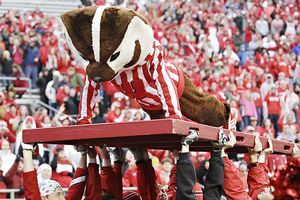 The routine is the mascot does seven pushups when Wisconsin reaches seven points, 59 pushups when Wisconsin reaches 59 points and so on. Add 'em up. At some colleges and high schools, the cheerleaders also do cumulative pushups representing the score. I bet the Wisconsin cheerleaders were glad they weren't expected to snap off 573 pushups. Was the final score poor sportsmanship? Normally the gauge of sportsmanship in football is whether a team with a big lead stops passing in the second half. Wisconsin runs the ball so well that to hold down the score, the Badgers should switch to passing. Wisconsin starters left the game early, and Wisconsin tactics in the second half were bland. The missing sportsmanship touch was that, leading 62-13 at the start of the final stanza, Wisconsin kicked extra points on its three fourth-quarter touchdowns. The Badgers should have knelt on the PATs. Here are Wisconsin's possession results: touchdown, field goal, touchdown, touchdown, touchdown, touchdown, touchdown, touchdown, touchdown, field goal, touchdown, touchdown, touchdown. Buck-Buck-Brawckkkkkkk: Trailing Miami 23-17 in the fourth quarter, Tennessee punted on fourth-and-2 from its 43, though the Flaming Thumbtacks rushed for a 5.4 yards-per-carry average on the day. It took the Dolphins just three snaps to pass the point where the ball would have been if the Titans had gone for it and failed. South Florida scored on the game-icing touchdown on the possession. It's the fourth quarter, you're trailing, don't punt on fourth-and-2! Dolphins note: In two games against Miami for two different teams, Randy Moss caught a total of one pass off Vontae Davis, who is this year's Darrelle Revis. AP Photo/Paul Sakuma The cross is a personal choice -- but get that clipboard out of your pants! In San Francisco, They Know About Sweet-n-Sour: San Francisco looked finished with Les Mouflons leading 17-13 with 2:30 remaining and the Forty-Niners facing third-and-32 in their territory. Troy Smith threw to Frank Gore in the left flat for 14 yards, then on fourth-and-18 threw the same play again in the left flat to Gore for 23 yards, then threw to Michael Crabtree for the touchdown. Converting a third-and-32 was sweet for the Squared Sevens, allowing the conversion on the same play on consecutive snaps was sour for the Rams. St. Louis kicked a field goal to force overtime. When San Francisco got the ball in the fifth quarter, the Niners went to Gore left for three consecutive snaps as part of the winning drive. What the heck happened to the St. Louis right flat -- offensive left -- defense late in this contest? 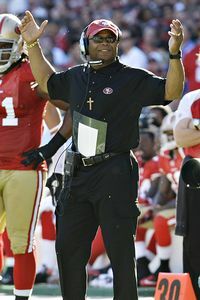 Mike Singletary showed up on the sideline with a cross around his neck and a clipboard stuffed down the front of his pants. The clipboard -- Mike, aren't you concerned with reproductive health? The cross -- purely religious, or did Singletary think there were vampires in the crowd? Maybe Singletary has been listening to "Devil Town," the jokey vampire song that was prominent in the first two seasons of "Friday Night Lights." But I wouldn't worry about vampires. At this point they all have television shows and don't want bad press. The final season of "Friday Night Lights" has begun on DirecTV, migrating to NBC in the spring. Next week I'll update on the longing glances, stolen kisses and last-second, length-of-the-field game-winning touchdowns. Timothy T. Ludwig/US Presswire "We did it! We did it! We defeated a team that has lost 25 straight on the road!" Hell's Sports Bar: Hell's sports bar has 28 wide-screen plasma TVs, but certain blackout restrictions may apply. Sunday, every wide screen in hell's sports bar was tuned to the Detroit at Buffalo contest, pairing teams that entered a combined 2-14 on the season. "Those records are deceptive," Scott Hanson of NFL Network said, trying make the game seem interesting. He's right -- the teams might have been a combined 0-16. It came down to Buffalo leading 14-6, Detroit facing fourth-and-2 on the Bills' 20 with 19 seconds remaining, Lions out of timeouts. On the play, Detroit's best threat, wide receiver Calvin Johnson, was covered by the Buffalo middle linebacker: touchdown. Now Detroit needs the deuce to force overtime. Run against the league's 32nd-rated rush defense? Football Outsider stats show that in the NFL, on fourth-and-2 -- the deuce situation -- the run succeeds 62 percent of the time, versus the pass succeeding 37 percent of the time. Not only is the play not a rush, quarterback Shaun Hill retreats all the way to the 12 before throwing out of the end zone seemingly to prevent a sack. On a try! Middle linebacker covers the other team's best wide receiver on the game's first key snap, visitors throw against the league's worst rush defense on the second key snap -- these are awful teams, all right. Ideal entertainment for hell's sports bar. 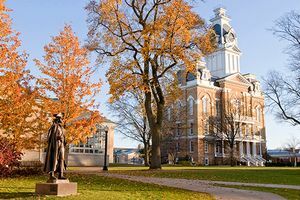 Hillsdale College The serene campus of Hillsdale College in -- quick, where? Just Try to Identify Us, Baby: Suddenly the Raiders are a hot ticket. Oakland has not beaten any elite team, so TMQ is not yet sold on the Raiders. But TMQ is struck by the Oakland depth chart. Players other teams didn't want (Cooper Carlisle, Langston Walker) or unloaded cheaply to be rid of (Jason Campbell, Kamerion Wimbley, Quentin Groves). Undrafted players (Tommy Kelly) and small-school players (Jared Veldheer -- quick, in what state is 1,400-student Hillsdale College located?). Oakland-drafted players you've never heard of (Brandon Myers, Trevor Scott, Lamarr Houston, Walter McFadden, Tyvon Branch, Stanford Routt). The only players on the depth chart who arrived with blue-chip status are Darren McFadden (no relation to Walter), Richard Seymour, Michael Huff, Darrius Heyward-Bey, Rolando McClain and Robert Gallery (who five years after being proclaimed a draft mega-bust at left tackle is performing well at guard). And even then, only aficionados know Huff and McClain. This is a team after TMQ's heart -- castoffs and who-dats. Correction of a New York Times Correction of a Correction: TMQ has switched to a new system of collecting amusing New York Times corrections and running them on fast-forward twice a year, in my Super Bowl column and in the August number that restarts the column. But in the case of a correction that appeared yesterday, I can't wait. At the bottom here, the Times corrects an article from the previous week, saying it "misstated the date of a correction in which The New York Times finally apologized for having ridiculed, in 1920, the idea that rockets would one day be able to leave the surface of the Earth." The 1920 editorial is indeed infamous for mocking Robert Goddard, inventor of the liquid-fueled rocket. But the 1920 editorial did not ridicule "the idea that rockets would one day be able to leave the surface of the Earth." The 1920 editorial ridiculed the idea that a vehicle could accelerate in the vacuum of space, asserting rocket propulsion would function only in air. Goddard, the Times huffed in 1920, "does not know the relation of action and reaction, and of the need to have something better than a vacuum against which to react." We all make mistakes. But neither the writer -- who's deputy science editor of The New York Times -- nor the corrections editor appears aware of the entirely different physics questions involved in whether rockets could leave the surface of the Earth (this had long since been proved in 1920, and the 1920 editorial acknowledged yes!) and whether rocket propulsion would function in a vacuum. If science editors are sloppy about science and corrections editors are careless with facts, doesn't this mean the mainstream media ... let's not complete that sentence. NFL -- Mandate the Safest Helmets! : DeSean Jackson has returned to playing after suffering a severe concussion a month ago. Let's hope he has not come back too soon. Jackson has changed helmets, switching to a Schutt DNA which, like the Riddell Speed, reduces the likelihood of head trauma. (The new Xenith brand helmet probably does too, but hasn't been in use long enough to be sure.) No helmet can prevent concussions, but the DNA, the Speed and probably the Xenith diminish the chance of concussions. TMQ asks again -- why doesn't the NFL require all players wear one of these three? While talking a big game about wanting to prevent concussions, the NFL continues to take an "I see nothing" attitude about helmet choices, saying this is up to the individual player -- rather than requiring the safest equipment. Two weeks ago TMQ supposed that the NFL may not mandate the safest possible helmets because it believes -- rightly or wrongly -- that if it tells players what to wear, then it is liable if they sustain head injuries. Reader Aaron Maki of Seattle writes, "As a practicing attorney, I know that while it seems foolish to not recommend safety equipment, the phenomenon is not, unfortunately, limited to the NFL. I spent a fair amount of time racing sailboats, and have found that in 99 percent of the regattas in which I participate, life jackets are not required by the race committee. When I asked a race committee chairman why life jackets were not required, he responded that the race organizers wanted to avoid liability if anyone who was wearing a required life jacket fell into the water and drowned. For shame." AP/Margaret Bowles The Tampa cheerleaders did not expect to be rooting for a 6-3 team. Dr. Jekyll and Mr. Martz: Chicago leading Minnesota 20-13 in the fourth quarter, the Bears faced third-and-1 at the Vikings' 19. Mike Martz had spent most of the game in his good Dr. Jekyll personality, not his sinister Mr. Martz persona. Now he put a heavy formation on the field; had a fullback shuffle sideways in a "slide block" motion, which almost always means the run will go behind the slide-block man; then play-faked and threw straight up the field to blocking tight end Kellen Davis for the touchdown that iced the contest. Earlier, Chicago scored a touchdown when tight end Greg Olsen lined up wide and ran a stop-and-go like a split end. Mike Martz game plans either are really good or really awful, and Sunday's was good. Brett Favre tossed a 53-yard touchdown to Percy Harvin into a steady 20 mph wind -- pretty impressive for a 41-year-old. But Favre also threw three picks and lost a fumble; his turnovers cost Minnesota its chance. Favre now leads the NFL in interceptions, while having a lower passer rating than Ryan Fitzpatrick and Shaun Hill. Favre may be effective for his age. But strictly based on performance, he belongs on the bench. Jacksonville Becomes the Dillon Panthers of the NFL: Jacksonville has now won games on a final-snap 59-yard field goal and a final-snap 50-yard Hail Mary. You have to feel for Texans defender Glover Quin, who tried to knock the pass to the ground -- exactly what defenders should do to a Hail Mary -- only to see it carom to Jax's Mike Thomas for the winning six. Every year there are a hundred Hail Marys in the NFL and college, and every year, one of them works. Fitting that the Moo Cows, with the league's worst secondary, should surrender this one. After the score, zebras flagged the Jaguars for excessive celebration, then declared the penalty unenforceable. Guess so -- the game was over! But officials required Jacksonville to run a try, rather than simply end the game at 30-24. Since the PAT was irrelevant to outcome and net points is now so low on the tiebreaker list it hasn't been used in decades, why couldn't Jax just have jogged up the tunnel? Indianapolis, the Shangri-La of Undrafted Free Agents While other teams get disappointing performances from first-round-drafted megabucks players, the Colts continue to roll out undrafted free agents who do well. Undrafted Javarris James, the Colts' fourth-string tailback, scored a touchdown in the Indianapolis victory over Cincinnati, while undrafted Jeff Linkenbach started at guard and performed well. TMQ told you last April that James and Linkenbach would be successful in the NFL. What incredible insider information did I posses? None! I simply knew they were undrafted free agents who signed with Indianapolis. Also, undrafted Gary Guyton had a terrific game for New England. You know what position Guyton plays, right? Jim Urquhart/AP Photo The Horned Frogs need their "A" game to take on their ultimate opponent, the BCS cartel. The BCS Itself Needs Style Points: Unless there's a playoff, no system for arranging bowl games ever will be satisfactory. The BCS is an improvement over the previous regime, in which mismatches were common, and bowl invitation offers were made long before Thanksgiving, as bowl committees raced to cut each other off to high-profile teams. Without the BCS, for instance, one of the major bowls might have signed Alabama before its second loss, while another might have signed Texas in October. But the BCS is only somewhat better than the old bowl-a-rama signing ruckus. Last autumn, had Nebraska beaten Texas at the end of the college regular season -- and the Cornhuskers came within one play of doing so -- the January 2010 BCS title game would have matched Alabama against Cincinnati, which ended up being pummeled 51-24 by Florida in another bowl. This year, all Big East schools already have three losses, and one is assured a BCS slot because the Big East gets an automatic qualifier. A scenario is evolving in which a Big East school with three or even four losses would play in the BCS while at least one single-loss team, such as Michigan State, Nebraska or Stanford is excluded. The BCS may offer a a spot to a Big East team that's not even in the top 25 while numerous top-25 teams are shut out; there is a strong chance a high-quality SEC team will be excluded while the BCS invites a Big East team that makes everyone snicker. This sounds just as dumb as the old bowl-a-rama format. Paramount Television Don't let him vote! He likes Boise State! And with TCU and Boise State undefeated but disfavored by the BCS setup, there's huge potential for a BCS title game that will be seen as completely bogus. The BCS insiders will do everything in their power to keep TCU or Boise State out of the title contest, and BCS insiders pull the strings. Regardless, the obsession with style points and victory margins has gotten out of hand. One-third of the BCS ranking is based on the USA Today poll of coaches -- and most coaches are voting on hype and victory margins, since they can't possibly have time to watch film of any contenders they don't face. Retired college coach R.C. Slocum contends this poll of retired college coaches should replace the USA Today poll in the BCS formula, since retired coaches do have time to take a close look at film of every contending team. Is the BCS capable of reforming itself to eliminate the automatic-qualifier bias toward insider conferences? The BCS system has always been foremost about controlling money and media exposure -- and the big AQ conferences don't have any reason to want to share either. BCS note: Can sportscasters and sportswriters please stop referring to the USA Today and Harris polls as the "human" polls? 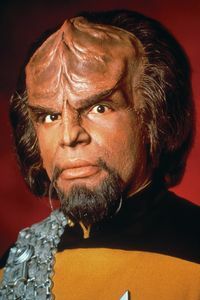 No other species gets a vote -- the BCS is obviously worried the Klingons would like TCU more than Auburn. Disclaimer of the Week: Justin Gibides of Philadelphia notes "this announcement is 285 words and the disclaimer that follows is 648 words." Stop Me Before I Blitz Again! : City of Tampa leading Carolina 24-16 with 4:40 remaining, the Bucs faced third-and-15 in their own territory. Play straight defense here and a stop is statistically likely ... It's a mega-blitz! Tampa converts and scores the game-icing touchdown on the possession. 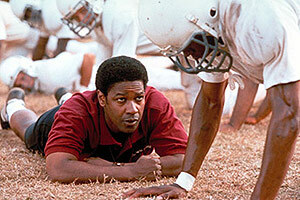 Walt Disney Pictures Denzel Washington was a commanding coach. Forget the Titans: Once again T.C. Williams, the high school on which the movie "Remember the Titans" is very loosely based, failed to make the postseason. This happened even though Virginia's new Texas-like system takes so many schools it's hard to miss the playoffs. T.C. Williams has not appeared in the Virginia football playoffs since the movie hit theaters. Unified Field Theory of Creep: Craig Rosenkranz of Washington, D.C., writes, "A few weeks ago I purchased a subscription to Bon Appetit magazine. Before I received my first issue, I got an e-mail asking me to renew." Andrew Watson of Alexandria, Va., reports, "Last May, I purchased tickets for the first two rounds of the NCAA basketball tournament, in D.C. next March. Check out the Ticketmaster e-mail I just received: 'Hello Andrew. You went. You watched. What'd you think? Post a review now of the 2011 NCAA Div. I Men's Basketball 2nd & 3rd Round.'" Streeter Lecka/Getty Images It doesn't happen for five months -- have you reviewed it yet? Brandon Behling of Boston reports, "Last week I received an e-mail from Ford Motor Company urging me to, 'Hurry and reserve your 2012 Focus now.' Bad enough that a 2012 model goes on the market in spring 2011. Ford wants me to 'reserve' a 2012 model. Are they expecting a mass produced car to sell out that quickly?" David Zolnowski of Depew, N.Y., reports, "The Buffalo News just had an advertisement noting the Buffalo Bisons will be hosting the Triple-A All Star game at Coke-Cola Field on July 12, 2012, and encouraging people to buy tickets early. Not only is that 20 months from now, most of the people who'll play in that game probably aren't even in AAA yet." Bill Baker of Orlando, Fla., noted on Nov. 11, "The top story on ESPN.com this morning was a mock NFL draft, and a mock men's NCAA basketball bracket was prominent. Todd McShay predicted the NFL draft six months before it will occur, and long before we know who will declare. Joe Lunardi predicted the March Madness brackets when most of the eligible teams had yet to play a game!" Last year I complained that my New York Times calendar -- traditionally a holiday tip is given to the newspaper delivery person in exchange for a calendar -- arrived in creep fashion on Nov. 29. When I was a newsboy as a teen, there was lively debate among newsboys about whether it was better to deliver holiday calendars the week before Christmas, when presumably customers were in generous moods, or two weeks prior, before customers realized how much it was going to cost them to get through the holidays. Anyway last year I complained that Nov. 29 was ridiculously early, a month before Christmas and two weeks before Chanukah that year. This year, my Washington Post holiday calendar has already come -- it arrived on Nov. 13. Warner Bros. "Oh Harry, when we're older, can we live together someplace that's not computer-generated?" Did Harry Cast Mobilicorpus on Himself for the Kiss? : Harry Potter and the Final Marketing Campaign of Doom Until We Announce More Sequels Part One hits theaters on Friday. Daniel Radcliffe and Emma Watson, who've been playing Harry and Hermione since 2001, when they were age 11, have a make-out scene in the new flick. Let's hope Radcliffe stood on a step stool, since Watson now towers over him. Radcliffe, surely hoping to generate buzz for the scene, just said Watson "kisses like an animal." Um -- he's kissed animals? Maybe Atlanta Is the NFL's Best Team: The Falcons have won 10 of their past 12. Atlanta plays without much flair and doesn't have many stars -- how many Falcons defensive starters can you name without looking? -- but is methodically effective. The Falcons have drafted well -- most of the starters are Atlanta draftees and have spent their whole careers with the team, which is good for cohesion. Trailing Baltimore 21-20, Atlanta took possession at its 20 with 1:05 remaining, holding one timeout. The Falcons went down the field as if the Ravens weren't there, scoring a touchdown to win in eight plays and just 45 seconds. Nothing flashy -- a series of well-thrown short passes, capped by a Baltimore six-man blitz when Atlanta was on the Nevermores' 33 with 27 seconds showing, the blitz leaving super-effective Roddy White single-covered by backup corner Josh Wilson. Since the super-effective White already had 11 receptions when that play started, and already had been thrown to 16 times, why was he single-covered by a reserve? You tell me. Baltimore players complained of exhaustion from playing Sunday, then traveling to Atlanta to play Thursday. The Falcons played Sunday then Thursday too, but didn't have to travel, so maybe the final Atlanta drive was determined by Baltimore fatigue. But Atlanta sure looked as if it knew what it was doing at the endgame. Time to put the Falcons on the radar. Tom E. Puskar NFL scouts -- if you're looking for the next Pierre Garçon, check out Joe Horn of Ashland. 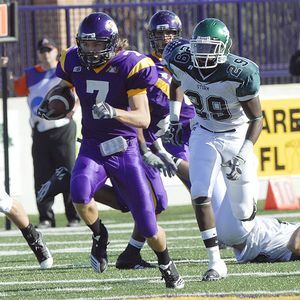 Obscure College Score of the Week: Ashland 87, Lake Erie 14. Wisconsin thought it had the year's highest NCAA score -- it didn't even have the day's highest score! Wide receiver Joe Horn of Ashland recorded six touchdowns in the first three quarters, then sat out the rest of the contest. (Horn also had a six-touchdown game in high school. Will he be the next unknown small-school receiver to make it in the NFL?) Lake Erie committed seven turnovers and allowed several return touchdowns, so Ashland, which stopped attempting passes midway through the third, doesn't seem guilty of running up the score, though like Wisconsin it should have waived its late PAT opportunities. Located in Ashland, Ohio, Ashland University will hold its Christmas festival before Thanksgiving. Bonus Obscure College Score of the Week: Bowdoin 26, Colby 21. OK, these schools are not obscure, but I make an exception because this was the final college football game for my son Grant, Bowdoin's left tackle. Plus you gotta love a contest that pits the Polar Bears against the Mules. Leading 26-21, Bowdoin took possession on its 1-yard line with 9:17 remaining and staged a 14-play clock-killer drive, closing out the game. Twelve of the snaps were rushes, allowing Grant and his fellow offensive linemen a moment in the sun as the season concluded. Grant's best two college games were his final two, both victories, honoring the sports-lore maxim, "Save the best for last." It really just doesn't seem that long ago that I was showing him how to put on a flag belt for the county sixth-grade flag football league. Located in Waterville, Maine, Colby lists its "Eco Alumni." Weasel Coach Watch: Dan Hawkins repeatedly said he'd stay loyal to Boise State, then when big bucks were dangled by Colorado, practically set the ground on fire racing to take the money. 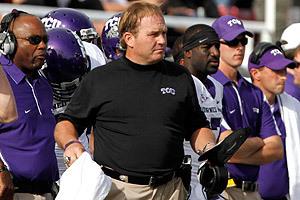 Now he's out of a job after the Buffaloes lost a 28-point fourth-quarter lead to Kansas. The fatal error by Colorado coaches was not, as sports radio said, putting the ball in the air in the fourth quarter. The fatal error was Colorado coaches being surprised by a Kansas onside kick with the score 45-24 and 11 minutes remaining in the contest. Reader David Hewitt of Irvine, Calif., notes Kansas used a type of onside TMQ has long favored: Rather than a mad scramble for the ball, four of the five players on the kick side were assigned to block receiving-team players out of the way while the fifth went for possession. 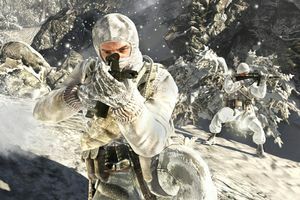 Activision "We can't handle these zombies alone -- we need to call in Richard Nixon." More Proof of the Decline of Western Civilization: Not only did huge numbers of people buy the latest "Call of Duty" video game -- which allows you to play the role of Richard Nixon killing zombies -- but Jeep announced a Call of Duty edition of its Wrangler model, to be released next month. Jeep is owned by Chrysler, which received a $8 billion federal bailout. Please don't tell me tax money is being forcibly removed from our pockets to subsidize a car themed for a video game. Reader Comments: A reader proposed that players in Division I football and men's basketball (the only NCAA sports that don't lose money) be paid small stipends, as are teaching assistants and college newspaper editors. Joe Gram of San Diego notes that the University of California at San Diego sort of uses this system. A Division II school, UCSD does not award athletic scholarships, but gives athletes in all sports a $500 per semester stipend to recognize that what they do contributes to creating a collegiate environment. This isn't exactly what TMQ has in mind for the big-deal football and men's basketball programs, but is a step in the right direction. I praised the shrinking number of top colleges that still offer both need-blind admission and full-cost financial aid. Michael Horowitz of Philadelphia notes I left the University of Pennsylvania off the list, and Joyce Barnerd of Dallas notes I left Vanderbilt off the list. I wondered whether near-death experiences prove the brain and the psyche are separate -- since the brain appears to generate pleasant images to soothe the psyche's fear of dying. Melody Blass Fisher, a doctoral student in clinical psychology at the University of Massachusetts, writes, "Psychologists have been aware of this phenomenon for some time. What you're talking about is different portions of the brain, the conscious and unconscious. The non-conscious part of the brain does stuff like suppress emotions that aren't safe to have (childhood anger at a powerful parent, romantic feelings toward an off-limits individual) while constantly monitoring background noise for important information. It also processes visual stimuli amounting to tens of thousands of pieces of information every second and turns it into the visual images we 'see,' or transforms squiggles into written words without your ever having to think consciously about it. "Your conscious mind can only do so much at one time -- how much can you be actively thinking about at once? Your non-conscious mind has a vastly larger capacity, which is why much of this work is off-loaded. Try as you might, you can't consciously access how your brain performs these tasks. "As regards near-death experience, psychology researchers have identified the phenomenon you're referring to -- the brain working to temper our anxiety about death -- and called it Terror Management Theory. This theory suggests that since human beings are unique in ability to understand their own mortality, a large portion of our brainpower is devoted to managing the extreme anxiety associated with the knowledge of our inevitable death. So this isn't so much a matter of the 'physical brain and the psyche functioning independently,' but there are aspects of the psyche that function outside of our consciousness, and one of their many tasks is to protect us from anxiety about our mortal state." Finally, Jason Siko of Pontiac, Mich., writes, "It's assumed that concussions in football are increasing because of faster, stronger players. Could the problem primarily be due to the rise of spread-formation and short-passing offenses? These increase the number of downs in which a receiver moving at full speed must expose his body to a defender approaching at full speed. In the old cloud-of-dust running offenses, it was rare for ball carrier and defender both to be sprinting when they hit. Before the West Coast offense and its imitators shifted the emphasis to short crossing routes, receivers generally went long: when they were hit, the hit came from the side and from a defender basically running in the same direction. In spread-the-field offenses, receivers are more likely to start outside then cut across the middle, where full-speed opposite-direction hits have become common. "Full-sprinting football players reach about 15 mph. In a power-rush offense, the ball carrier rarely gets to full sprint. He's moving maybe 10 mph and defenders approach at the same speed or less, for a collision speed of 20 mph or less. But when a receiver runs a short crossing route at 15 mph and the safety approaches from the opposite direction at 15 mph, the collision speed is 30 mph. This really ups the ante. "This year's vicious-hits concussions mainly have involved receivers and defenders on short crossing routes. The physics of spread-passing offenses are creating circumstances that lead to maximum-speed head contact. With spread offenses and short passing proliferating at all levels of football, perhaps it is time for a larger re-examination of the rules." Single Worst Sequence of the Season -- So Far: OK, this is only the Arizona Cardinals -- though they are but two years removed from the Super Bowl. Arizona trailing Seattle 23-10 late in the third quarter, the Blue Men Group showed big-blitz. Derek Anderson audibled to a max-protect -- eight blockers, only two receivers. Seattle rushed six against eight blockers, almost instant sack, recovered the fumble, and a moment later the lead is 26-10. Aaron Curry of Seattle got the almost-instant sack -- he was double-teamed by Stephen Spach and Tim Hightower of Arizona, and easily shoved both out of the way. Now it's the next Arizona offensive snap. Seattle defensive end Chris Clemons blows through for an almost-instant sack on first down, and the Cardinals end up punting. Clemons was double-teamed by Hightower and tackle Levi Brown (the fifth overall pick in the 2007 draft), and easily shoved both out of the way. Okay, it's only Arizona. But Arizona Cardinals, you are guilty of the single worst sequence of the season -- so far. Next Week: Watching the Chargers' special teams causes TMQ to have a near-death experience.